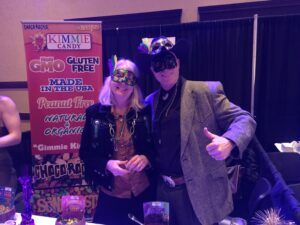 Bright costumes and colorful beads were everywhere as the Rotary Club of Reno celebrated Fat Tuesday while hosting its largest and brightest fundraising event at the Downtown Reno Ballroom. Highlights of the evening included wine tasting stations and food samples from local restaurants. We tasted everything from tacos to cajun food, topping the evening off with champagne and some homemade pralines that could have come straight from New Orleans. The event supports the Reno Rotary Foundation. Ticket sales, and proceeds from the silent auction fund community service projects, scholarships and many other worthwhile causes. The club donated more than $193,000 last year to local and international programs. Volunteers make it all possible and Rotary gave a shout out to University of Nevada ROTC cadets who greeted people at the door. So keep this Mardi Gras celebration in mind for next year and let the good times roll! As I talk to people out in town, many are happy for the snow, but they wish it would snow somewhere else for awhile! We love that the snowpack in the Sierra is 100% and that the ski resorts are seeing plenty of business. 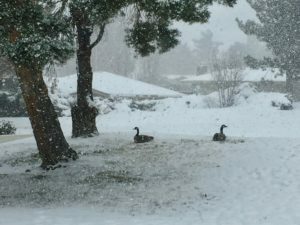 But it’s also nice to see the grass once in awhile, play with the dog outside (mine’s a Border Collie, not a Husky) and put away the snow boots for a week. All the same, it makes for some beautiful photos. Enjoy the winter. It’ll be 90-degrees before we know it. Volunteers were busy this Saturday bringing the original pews back to the historic Lear Theater building in downtown Reno. They’re getting ready to host an all day TEDx conference there on June 6th. TEDx organizers want to combine history with new possibilities for the well-known venue. The Lear Theater, which was built as a church in 1939, has been closed for the past 12 years while community leaders formulated a plan for its future. TED talks feature speakers who share ideas and inspire others with topics from science, to business to local issues. TEDx events are independently hosted conferences. 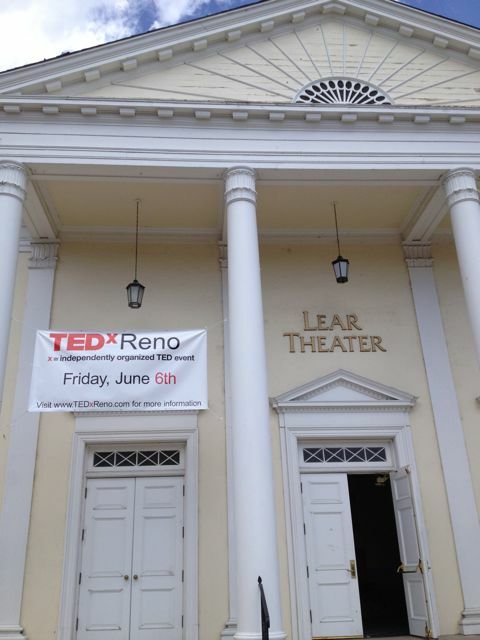 TEDx Reno’s Meghan Pescio said the Reno landmark is the perfect place for sharing big ideas. “We want to help the community re-imagine what the Lear Theater would be like if it was a functioning, open theater for local performers and for the community,” she said. The Lear has undergone major renovations, paid for by fundraising campaigns. But more repairs are needed. For the event in June, it will serve as a type of ‘special events tent’ with pillars. “We have to bring in power,” said Doug Erwin of EDAWN. “We have to bring in water, we have to bring in air conditioning,” he added. Erwin says the event will cost about $70,000 which will be paid for with a mix of sponsorships, in-kind donations and ticket sales. He believes the Lear can be an integral part of redevelopment in downtown Reno. “TED is all about ‘Ideas Worth Sharing’ and for TEDx Reno our big idea is to re-launch the Lear Theater in the community,” he said. Two years ago Artown agreed to take over the theater and is overseeing plans for future renovations. Organizers expect to fill all 400 seats for the event, and say that tickets usually sell out in the first 24 hours. For more information go to TEDxReno.com. And prepare to be inspired. Bailey Johnson was diagnosed with cancer as a baby and has endured 13 years of chemotherapy, radiation, surgeries and a bone marrow transplant. Recently he traveled to Capitol Hill to tell his story to Nevada lawmakers and urge them to help fund research and treatment for children struggling with cancer. 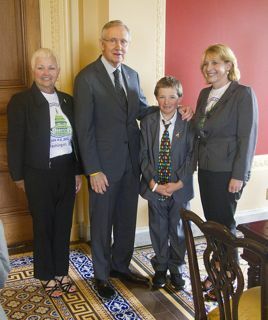 His grandmother Christy Smith and Debbie Strickland, Executive Director of the Northern Nevada Children’s Cancer Foundation, accompanied Bailey as he met with Nevada Senator Harry Reid, Congressman Mark Amodei and other lawmakers. Barrik Gold underwrote the trip. The trio journeyed to Washington D.C. to join other families from around the country for Childhood Cancer Action Day. During the event, families advocate for improved treatments for childhood cancer, more effective therapies and improving access to treatments. Debbie Strickland says the trip is an opportunity for Nevada families to keep our representatives informed on issues surrounding pediatric cancer. Bailey’s grandmother says through all the pain and treatment Bailey has emerged as a bright, caring, happy child who loves ice hockey. 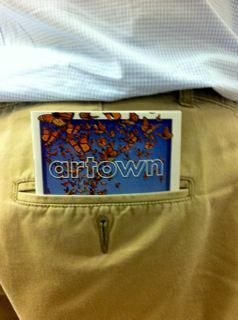 Take out your highlighter and get ready to mark your favorite Artown events in the newly returned “little book” of Artown. The little book fits in your back pocket or purse an lists nearly 500 arts, culture, music and dance events that fill Northern Nevada during the month of July. Last year Artown published a full-sized book of events, which did the trick, but fans of the arts festival have been clamoring for the return of the pamphlet-sized book that they can carry around and refer to at a moment’s notice. Artown listened, and it’s back. You can find a list of locations for the little book at Renoisartown.com. So get ready for 30 days of arts events for kids, grown ups and yes, even teens. 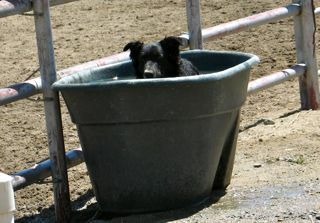 Cow Dog Trials Combine Skill, Intense Concentration. You don’t want to miss this year’s Reno Rodeo Cow Dog Competition Thursday at the Reno Livestock Events Center indoor arena. I went last year just to see what it’s all about and was mesmerized by the skill and concentration in the arena. And that’s just the dogs! 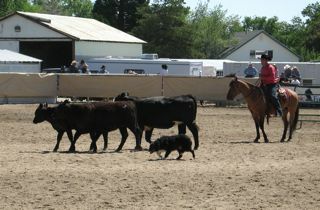 The handler is on horseback and guides the dog with whistles or commands as they work together to send a small bunch of cattle around obstacles and eventually into a big truck. The dogs are amazing as they surround the cattle, pushing them gently when necessary and rounding up the strays to keep them all headed in the same direction. More than 50 dogs and their handlers are signed up to compete. You can catch the action on Thursday, June 21 from 8am to about 5pm at the Reno Livestock Events Center. Rookie School for the Reno Air Races moved into the hangars at Stead Airport this week and race pilots, both brand new and seasoned, stood on the tarmac wit a feeling of hope for the long-time event. Last year the races were abruptly cancelled after a crash, and the future of the event has been in question. With some changes to the course, the Air Races are set to continue. Rookie school brings race pilots in early to let them fly the course and learn the standards and requirements of racing around the pylons. 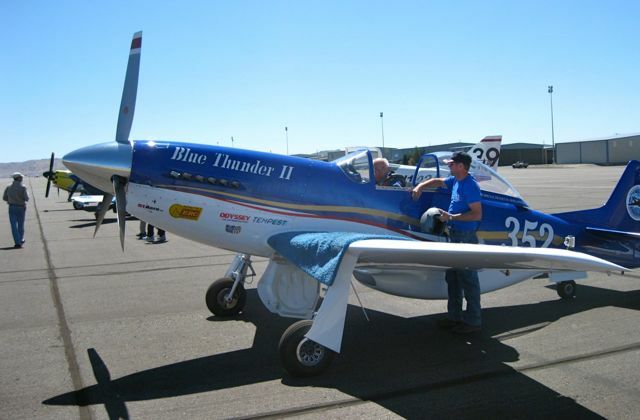 John Parker, President of American Air Racing, Ltd. is a local businessman who specializes in building and maintaining race aircraft and is based at the Stead Airport. This week he was flying his Thunder Mustang in advance of the races. We wish the best of luck to the men and women pilots, their pit crews, support teams and family and friends as they prepare to fly low, go fast and turn left. And do it all safely. Western Nevada College Professor Merilee Swirczek accepts the DAR Medal of Honor from the Daughters of the American Revolution for her exhibit "Always Lost - A Meditation on War"
Kudos to Western Nevada College Professor Marilee Swirczek who earned the DAR Medal of Honor for her work on the unique and moving exhibit “Always Lost – A Meditation on War.” The exhibit honors soldiers from the Iraq and Afghanistan wars and includes photographs, literary writings and the “Wall of the Dead” which displays photographs of the faces of men and women who have given their lives during the conflicts. The exhibit is a collaboration and comes in part from work done by students in Swirczek’s creative writing classes at WNC. 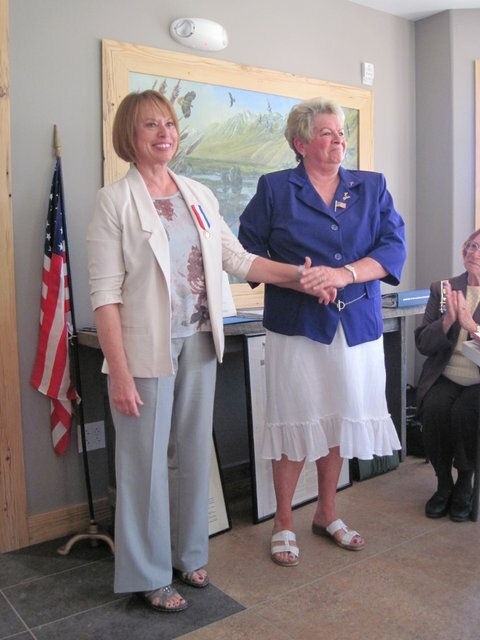 The Daughters of the American Revolution, John C. Fremont Chapter chose Swirczek for the medal, which is given to individuals who demonstrate extraordinary qualities of leadership, trustworthiness, service and patriotism. The exhibit has captured the attention of people across the country. You can see it next at Sierra Nevada College in Incline Village in September. Future plans have it making a trip to Washington, D.C. in the future. 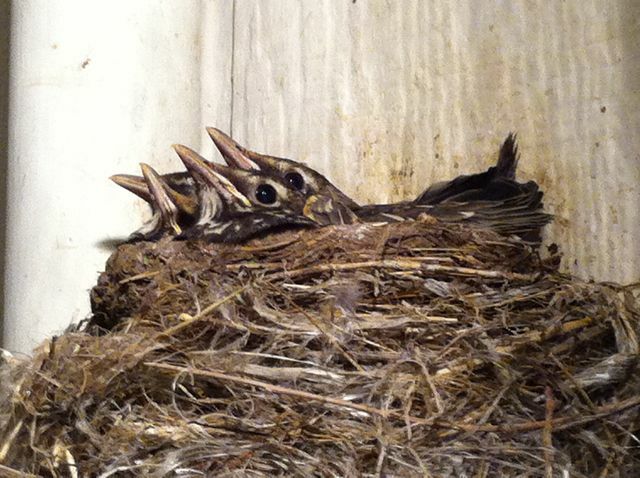 These four baby Robins are ready to find new adventures. The nest sits right on top of our electric meter and has been a popular place for babies since last year. I’m not sure if the same birds come back every year or not. But it’s fun to watch the little ones grow up and eventually leave the nest. The Reno High School Orchestra presented its spring concert with a bit of a twist this year, playing Camille Saint-Saens Carnival of the Animals, with humorous narration written by poet Ogden Nash. The suite of musical movements has been played all over the world, but this may be the first playing of the famous piece by a high school orchestra in Reno. I was invited to read Nash's narration which was written in 1949 to accompany the music. The Royal March of the Lion includes this passage: "The Lion is the king of beasts and husband of the lioness. Gazelles and things on which he feasts address him as your high-o-ness." The music was performed beautifully by the high school musicians and the audience laughed in all the right places. A competition of sorts, called "Concerto for Faculty versus Orchestra" had to be re-worked with parents standing in for faculty members (who were watching the Reno High baseball team in an important game.) I was volunteered by the conductor to play the cymbals during the 1812 Overture which is much harder than it looks. I have to hand it to whoever usually plays those heavy discs; they weigh a ton. We had a deal that I'd miss my cue two times when the big moment for cymbals arrives.. and the audience was in stitches, thinking that I had no musical ear whatsoever. I may not be a pro, but it was great fun. It's always good to see the talent and hard work put in by everyone involved in all three orchestras at Reno High. It was also a chance to honor the seniors who are graduating and are headed off on their next adventures.